I’m not sure if I’ll be playing Battleborn any time soon (this weekend’s closed beta is very limited), but I’d love more hands-on time to help sort out my complicated feelings about it ahead of the game’s February release date. I gunned my way through a 20-minute demo of a story mission at 2K’s E3 booth last summer and left disappointed—and slightly dizzy. It felt like Gearbox Software was trying to top Borderlands, its last original creation, with sheer volume instead of anything resembling a new idea. At some point, I was trying to modify my C3PO-like steampunk robot sniper’s skill tree, while simultaneously avoiding cartoony enemies and listening to a nattering narrator (who sounds like a John Cleese impersonator), and my brain nearly turned into space jelly. Looking back, part of my negative impression was colored by experiencing Battleborn on the E3 show floor—the equivalent of trying to enjoy a nice dinner at Times Square on New Year’s Eve. I also began to change my mind after getting some time with the competitive multiplayer modes at a recent press event. As it turns out, Battleborn’s DNA is spliced from way more sources than Borderlands. Gearbox has invented its own genre to describe it—“the hero shooter.” That’s kind of dumb (don’t almost all shooters have heroes? ), but there’s no better term for it without plunging into some serious video game wonkery. 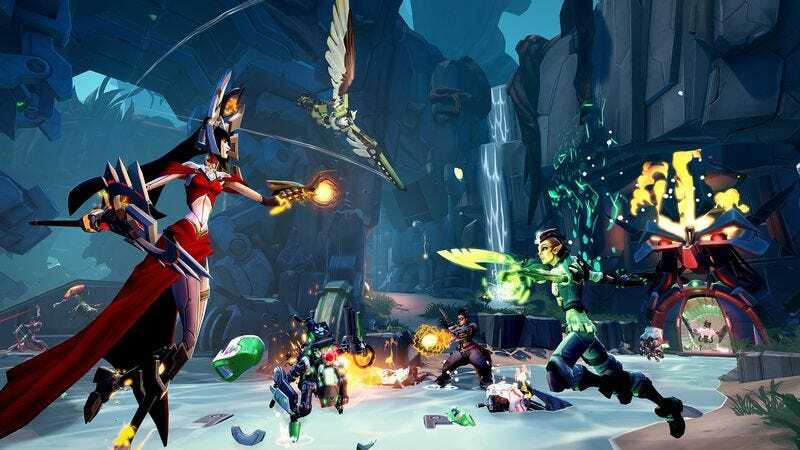 The multiplayer is a hybrid pieced together from traditional shooters, the five-versus-five team battles of MOBAs like League Of Legends, and even some tower-defense. While Borderlands was obsessed with hunting and gathering an endless supply of guns and equipment, Battleborn completely eschews in-game loot. It’s focused instead on a diversity of play styles. The roster of 25 characters certainly lacks narrative coherence—the elven archer, chaingun-wielding soldier, and anthropomorphic mushroom wizard all feel tossed into the same world at random—but it works in terms of giving players different roles and strategies. Some heroes are your typical run-and-gun assault class or a stop-and-pop sniper, others are wrecking balls when in spitting distance. The skeleton-faced A.I. named ISIC requires a steep learning curve because he’s a defensive character that can transform into a slow-moving turret of death. The most fun I had was in a mode called Meltdown, in which two teams score points by protecting robotic minions while they deathmarch into an incinerator in the middle of the map. You can focus on going toe-to-toe with opposing heroes, picking off minions, or playing the engineer and building turrets and heal stations in designated spots. I’m still not sure if Battleborn’s story mode is going to pan out, but after my two hours with the multiplayer, I’m hungry for more.